What is the angular momentum of the Moon in its orbit around Earth? How does this angular momentum compare with the angular momentum of the Moon on its axis? Remember that the Moon keeps one side toward Earth at all times. Discuss whether the values found in parts (a) and (b) seem consistent with the fact that tidal effects with Earth have caused the Moon to rotate with one side always facing Earth. This is College Physics Answers with Shaun Dychko. The orbital momentum of the moon is the orbital moment of inertia multiplied by the orbital angular velocity. We can model it as a single point mass a distance r o from the earth, that's the earth moon distance there. 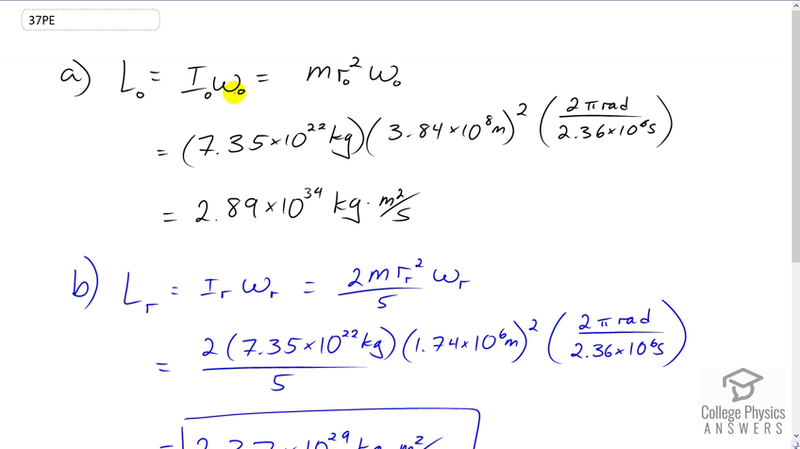 This is the mass of the moon and this is its orbital velocity. So we have 7.35 times ten to the twenty-two kilograms times 3.84 times ten to the eight meters squared, and its orbital velocity is going to be the one orbit which is two pi radians divided by its orbital period. This is the time it takes to do one full orbit. So it does two pi radians in every 2.36 times ten to the six seconds. This gives 2.89 times ten to the thirty-four kilogram meter squared per second. Now for the rotational angular momentum, we have the rotational moment of inertia multiplied by the rotational angular velocity. Now in this case we're modelling it as a sphere, a solid sphere, orbiting about an axis through the diameter. So we have two times the mass of the moon multiplied by the moon's radius, squared, divided by five and then multiply that by its angular velocity of rotation which turns out to be the same as the angular velocity of its orbit because tidal effects have caused the moon to rotate exactly once when it goes around the earth once, which is another way of saying that the same side of the moon is always facing the earth. So, we have two times the mass multiplied by the radius of the moon, 1.74 times ten to the six meters, square that, divide by five, times by two pi radians divided by 2.36 times ten to the six seconds. We get 2.37 times ten to the twenty-nine kilogram meters per second. So these two angular momenta are different by an order of magnitude, five orders of magnitude, ten to the thirty-four versus ten to the twenty-nine. We expected that. We expected the rotational angular momentum to be much less than the orbital angular momentum because given that the angular velocities of rotation in orbit are the same since they cover two pi radians in one orbital period. Then given that those are the same, we know that the rotational moment of inertia should be much, much less than the moment of inertia for the orbit because the earth moon distance is so much greater than the radius of the moon and so this is consistent with the fact that orbital angular velocities are the same and moment of inertia is much less in the rotation than it is in the orbit. So rotational angular momentum is less than the orbital angular momentum.